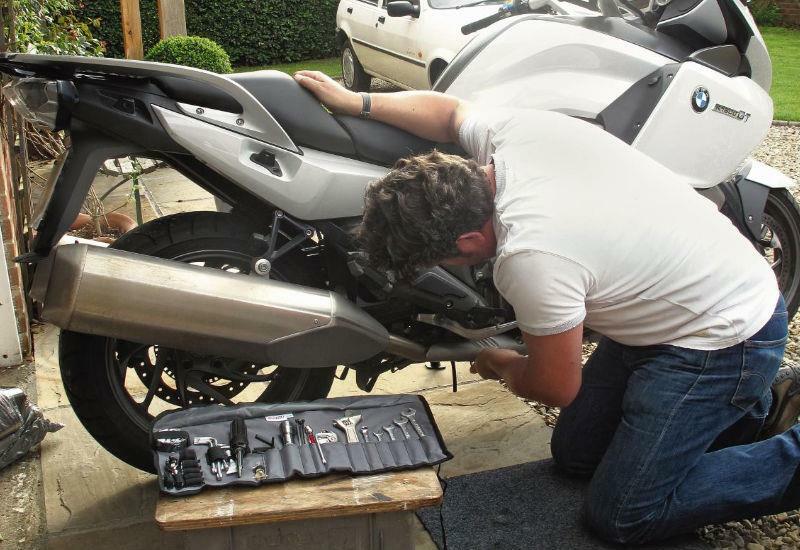 I recently picked up the first pair of Remus Hexacone slip on silencers in the country (www.performanceparts-ltd.com) to go on the BMW K1600GT and decided it might be fun to time just how long it takes the remove the old and fit the new. The titanium silencers have a carbon outlet, and are road legal with removable baffles – all in you’re looking at £866. These are considerably more compact and lighter than the stock items, saving 9.48kg a pair. 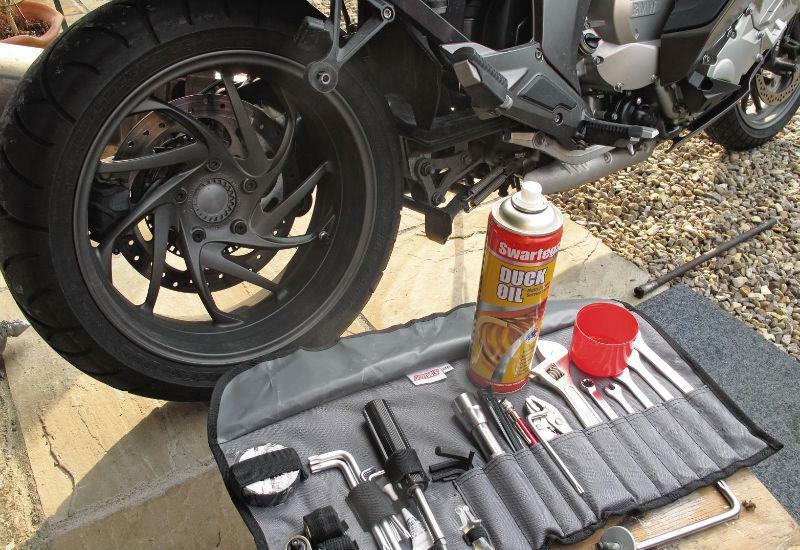 With my CruzTools Roadtech toolkit to hand, a can of Swarfega Duck oil and Quick Stop brake and clutch and cleaner along with an exhaust spring puller all at the ready, I started the clock. A good whiff of the Duck Oil on all the bolts and joints definitely make life easier when it comes to getting dry tight bolts off. Every bolt undone the silencer comes off relatively easily. The new Remus silencer has a stub pipe which fits into the front part of the exhaust that’s still attached to the bike, this is clamped in place using the original clamp (don’t do it up just yet). The silencer slips over the stub pipe and the can held in place on the exhaust hanger using the original bolt. Now with the silencer in place it makes it easier to fit the two exhaust springs, this is done with the aid of the spring puller, this tool definitely makes this task easier, without one it is possible to do this using a length of through the end of the spring and stretch it over the loop, then thread the wire back out. With it now loosely in place, I checked the alignment before tightening everything up. From start to finish on the first side it took only 20 minutes, this included cleaning all the new parts down with a clean rag and a liberal squirt of Quick Stop to remove any greasy finger prints which tend to stay as marks if not cleaned off before the exhaust gets hot. Now with one standard exhaust on and one Remus I thought it would be fun to start the bike up to see what the difference was, the note was definitely deeper than the stock BMW silencer, with this taster of what it sounds like I couldn’t wait to get the other one on. The second side only took fifteen minutes to do having learnt my way round the first one. With the pair on it was definitely deeper, a quick blast round the block proved this. The silencers increase the BMW’s enormous power by 2bhp; this would be very noticeable on 125cc bike but is a mere drop in the 160.5bhp ocean. One of the nice things about the Remus silencers is the fact you do not need to remap the fuelling as the work to the standard BMW air and fuel ratios. Also if you look into the end of the silencer there is a small domed Allen bolt – mine were tacked in place with a spot weld; no problem when you have a cordless Dremel, a quick buzz and they are ready to undo. With both baffles out I started the bike again. Now you’re talking! The straight six engine can now be heard as nature intended. Don’t get me wrong, this is not ear spitting or anything, just enough to give it a bit more of a roar, especially on full chat. I think I’ll leave the baffles out! 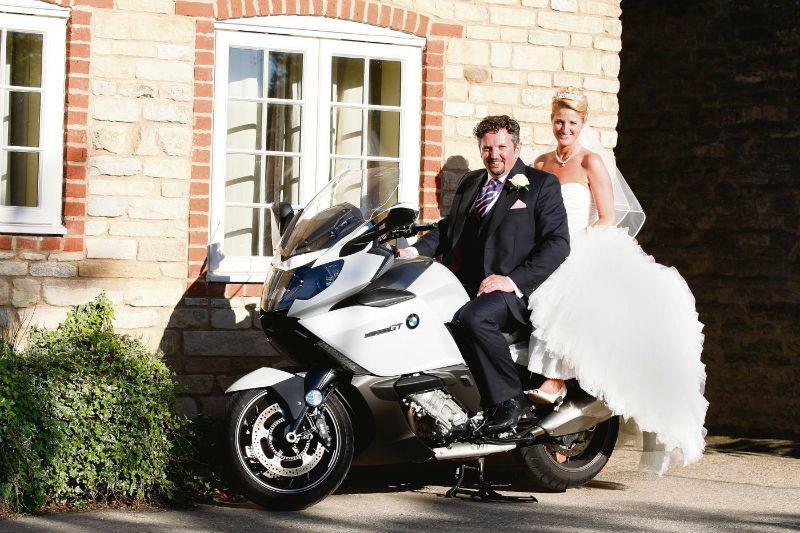 My wedding day has recently been and gone, and I did try to involve MCN’s K1600GT in the day. I had even attached white ribbons. Unfortunately the Bentley S2 won over the BMW on the day, but it was the perfect vehicle to take my bride back home from the hotel. By the way, the ribbons disappeared at about 70mph.